It can happen to even the most graceful of people. You are picking up a few last minute groceries to put together dinner after work, you are looking at the shelves to try to find just the right item, and then it happens. You slip and fall and find yourself on the floor embarrassed and in pain. Occasionally it might be your own fault due to an untied shoelace or heels a little higher than you are used to wearing, but sometimes it is not your fault. Sometimes it is the grocery store’s fault for allowing a dangerous condition to go unremedied and not warning you about it. In these cases, you may be entitled to compensation. 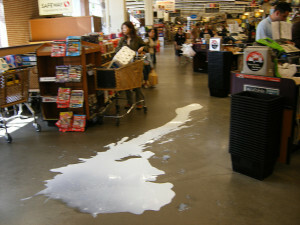 Grocery stores are especially common hosts of slip and fall accidents. They are open to the public, they often have slippery floors, and spills happen all the time. Often there are employees re-stocking the shelves during business hours, which can also create tripping hazards. Additionally, while weather may not be a common cause for dangerous conditions in our sunny climate, on the occasions where the weather does create slippery conditions this can make parking lots and entryways dangerous as well. It may seem like these falls are no big deal, and some of them are not. Sometimes you just suffer a bruised knee and a bruised ego. But other times the injuries can be serious. Who Is Responsible for Your California Slip-and-Fall Accident? When there is a potentially dangerous walking surface, the California property owner (or tenant) and the person who is walking on the surface each bear some responsibility for preventing the slip and fall and avoiding injuries. The California property owner must keep the property safe. Anyone who encounters a slippery or otherwise dangerous walking surface in California must also exercise reasonable care to avoid hurting themselves. California courts will look at the comparative liability of each party (in other words, how much responsibility the injured party bears and how much responsibility the property owner bears for the injury). This percentage of liability is then used to calculate how much the property owner must pay in damages or compensation to the injured party and how much of the cost the injured party will have to bear. 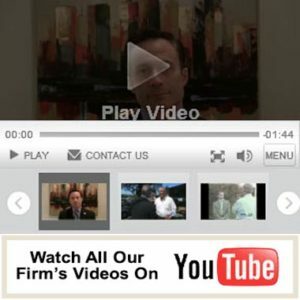 Call Fiumara & Milligan Law, PC Today! If you have been injured in a slip and fall in the North Bay area, you may be entitled to compensation. To learn about your rights you should contact the experienced personal injury attorneys at Fiumara & Milligan Law, PC. Call us today at 707-571-8600 OR 415-492-4507 and we will schedule a case consultation at no cost to you. We look forward to speaking with you and fighting for YOU! How Do We Sensitively Approach the Driver Safety Issues of Our Older Friends and Relatives?